Roof replacement is one of the most fulfilling improvement projects you can do. Whether you own a residential or commercial property or both, you will definitely find this project beneficial. Aside from enhancing a home or building’s protection against the elements, roof replacement will also help improve energy efficiency, indoor comfort and property value. However, before you can enjoy those benefits and many others, you need to make sure that you get all aspects of roof replacement right. When planning a roof replacement, one of the major parts of the planning stages is choosing your roof material. 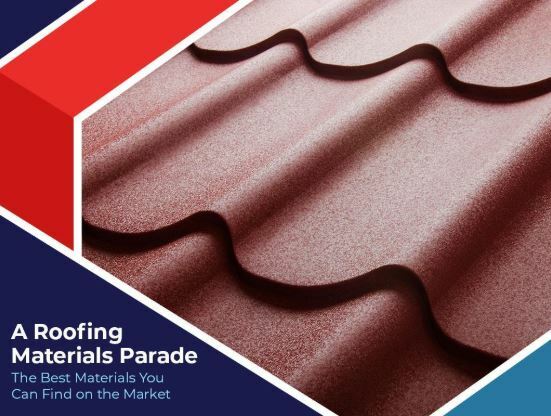 If your existing roof has been installed for several years now, it’s possible that you can find newer materials that offer more advanced benefits than your current roof material. So, if you’re thinking about getting the same material for your replacement project, you might want to hold that thought and consider other options first. As a trusted roofing company in Burke, VA, Orion Home Improvements has already worked with various types of roofing materials. In this post, we share with you basic information about the top materials that you can select from as you plan for your residential or commercial roof replacement project. From the affordable asphalt shingles to the rustic wood shakes, here are the best residential roofing materials on the market today. Among the roofing materials we list here, asphalt shingles are undoubtedly the most commonly used. They cover more American homes than any other type of roofing material. Aside from being affordable, asphalt shingles also provide outstanding protection. They also come in a wide variety of styles and colors, so you will definitely find one that best suits your home. Asphalt shingles are composed of an organic or fiberglass base coated with asphalt. Then, they are covered with colored mineral granules. These granules protect the asphalt shingles from the elements. Asphalt shingles are graded. Basically, the higher the grade, the longer the shingles’ life expectancy. Typically, these shingles last about 30 years. Want a roofing material that offers the affordability of shingles, the durability of tile roofing and the style of other roofing materials? Then, metal roofing is an option you should definitely consider. A metal roof can be made of various materials, including steel, aluminum and copper. It also comes in various forms or profiles. You can get them in sheets, which are more popularly known as standing seam metal roofing. You can also purchase metal roofing tiles. Both the standing seam and metal tiles have smooth texture and appearance. If you don’t like your roof to look obviously metal, you can choose stone-coated steel roof shingles that take the appearance of asphalt shingles. Some of the benefits of metal roofing include lasting durability, good rain and snow shedding, fire resistance, weather resistance, recyclability and maximum heat reflectance. Metal roofs are very easy to install and maintain. In all the years that we have provided roof repair, we have yet to repair or replace a severely damaged slate roof. This is primarily because slate roofs are some of the most durable and longest lasting out there. They can last anywhere between 75 and 200 years, or even more. Aside from their outstanding longevity, slate roofs are also beautiful, lending a home a classic and elegant appeal. Slate tiles, which are made from quarried slate rock, come in several shades. They are also fire and weather-resistant. To make sure that you enjoy the benefits of a slate roof, the underlying roof structure must be specially built to support the weight of the slate tiles. Furthermore, because of the uniqueness and more stringent installation requirements, slate roofing is more expensive than other types of roofing. Tile roofs are arguably among the most durable, long-lasting and environment-friendly roofing options available today. They are typically backed by comprehensive warranties with coverage ranging from 40 to 50 years. However, clay tiles are known to last for 100 years or more. A roof tile may be made of concrete or clay. Aside from durability and long service life, clay roofs also offer cost efficiency in terms of maintenance and lifetime costs. They also have excellent insulating properties, making for great energy efficiency. Clay and concrete roof tiles are also fire and weather-resistant, and come in a wide variety of colors and patterns. Wood shingles and shakes have been used to protect homes for hundreds of years. Today, many homeowners still choose wood roofing for various reasons. Wood roofing is popular due to the natural, unique and rustic appeal that they give a home. Homeowners who want to maintain the historic accuracy of their property also choose this material. When treated and installed properly, wood roofing can protect a home very well. Wood shingles and shakes can be treated to resist the elements and insects. Proper and adequate treatment can also make a wood roof last long. Wood roofing is also a great insulator and eco-friendly. Back in the day, when we talked about commercial roofing, we would often automatically think of flat roofs on buildings and metal roofs on industrial structures. However today, business owners now have more choices. If your building has a flat roof, then this is an ideal choice for you. Single-ply roofing membranes are categorized into two groups: thermosets and thermoplastics. Thermosets, which are made from synthetic rubber polymers, are ideal for large roof areas because they are designed to minimize seams. Meanwhile, thermoplastic membranes are best for smaller roof areas as they come in smaller sheets. The seams are welded together to create a continuous membrane. Both thermosets and thermoplastics are highly flexible, so they won’t easily break due to structural movement. They are also resistant to ultraviolet (UV) heat. Not all commercial buildings need to have a flat roof. If you have a smaller commercial property with a sloped roof, then you can choose any of these highly durable and aesthetically distinct roof materials. Metal, tile and slate roofing can give your commercial property the same benefits as a residential property. These include fire and weather resistance, durability, energy efficiency and longevity. Once again, if your commercial building has a sloped roof, you can also choose to install asphalt roofing. Since they are extremely affordable, they can easily fit into operating budgets. Asphalt roofing offers considerable benefits, too, so you won’t regret choosing it for your establishment. If you want a roof that will give your place of business a distinct appeal, then cedar shake or shingle roofing is something to consider. This is especially true if you’re running a business that goes well with a rustic and classic building. As long as the cedar shakes and shingles are installed and treated properly, you need not worry about the weather and insects doing a number on your them.